15.03.10 - The ice or water debate has long remained a fiercely contested subject amongst whisky drinkers and The Macallan has thrown its hat into the ring by creating an innovative serving method expressly for those who like their whisky with ice. 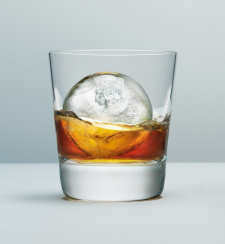 Believing the perfect serve to come down to personal preference, The Macallan has pioneered the Ice Ball Serve. It is the first real move by any whisky brand in the UK to present whisky in an innovative, contemporary fashion and open the doors to a growing adult population that regards ice as an integral part of the spirit-drinking experience. The Ice Ball Serve is based on the Japanese tradition of serving hand-carved ice with ultra-premium spirits. The ice ball press instantly creates a flawlessly formed sphere of ice that adds a touch of theatre and sophistication. The Macallan’s Marketing Assistant, Pat Lee, explains the science part: “The Ice Ball Press was inspired by Japanese cocktail culture where artisans hand-carve ice balls from massive slabs to create an uninterrupted surface that cools spirits quickly and evenly. The ice ball melts slowly to preserve the integrity of the spirit. We have updated this process, by developing a copper press that instantly trims a block of ice into a flawless ice ball. This, combined with our masterful single malt Scotch whisky, is The Macallan Perfect Serve. In essence; The Macallan ice ball serve takes this traditional practice to the ultimate level, with a single perfect sphere of ice, a unique beautiful serve with the benefits of maximum chill with minimum dilution.